The top secret operation, code-named “Project Seal”, tested the doomsday device as a possible rival to the nuclear bomb. About 3,700 bombs were exploded during the tests, first in New Caledonia and later at Whangaparaoa Peninsula, near Auckland. “Presumably if the atomic bomb had not worked as well as it did, we might have been tsunami-ing people,” said Mr Waru. “It was absolutely astonishing. First that anyone would come up with the idea of developing a weapon of mass destruction based on a tsunami … and also that New Zealand seems to have successfully developed it to the degree that it might have worked.” The project was launched in June 1944 after a US naval officer, E A Gibson, noticed that blasting operations to clear coral reefs around Pacific islands sometimes produced a large wave, raising the possibility of creating a “tsunami bomb”. “If you put it in a James Bond movie it would be viewed as fantasy but it was a real thing,” he said. Forty years after the joint testing, New Zealand faced a dramatic breakdown in its security ties with the US after it banned the entry of nuclear-armed ships from entering its territory during the 1980s. The dispute led to the US downgrading its relationship with New Zealand from an “ally” to a “friend”. In his new book Secrets and Treasures, Mr Waru reveals other unusual findings from the archives including Defence Department records of thousands of UFO sightings by members of the public, military personnel and commercial pilots. Some of the accounts of the moving lights in the sky include drawings of flying saucers, descriptions of aliens wearing “pharaoh masks” and alleged examples of extraterrestrial writing. The myth of the “sneak attack” on Pearl Harbor is a pillar of the “Greatest Generation” narrative that is the foundation of our interventionist foreign policy. Today is the seventy-first anniversary of the Japanese attack on Pearl Harbor, an act that brought us into World War II, pushed a reluctant America onto the world stage, and ushered in the age of empire. 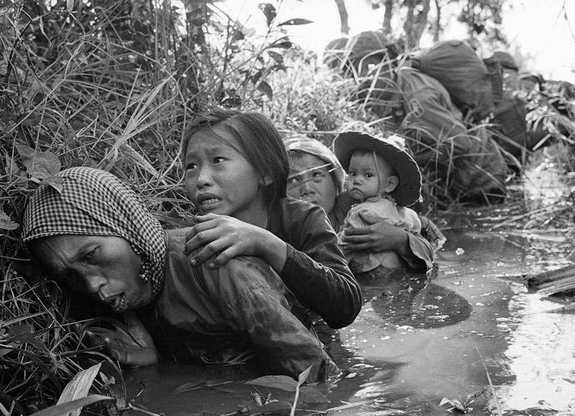 The official history of that event is that it was a “sneak attack” precipitated by war-crazed Japanese militarists, and that the totally unprepared Americans – kept from arming themselves by evil “isolationists” in Congress and the Republican party – were caught completely by surprise. There is, however, one big problem with this official history: it’s a lie. The Templar, a branch of the Masons, let their mystery sit quietly, until recently. Since the 1920s, the contents of a safe in the Hugh De Payens Commandery in Easton were a mystery. As new leaders of the Knights Templar passed through, some had different suggestions. Some wanted the safe drilled, but that would’ve been costly and voided their fire warranty. The Templar, a branch of the Masons, let their mystery sit quietly, until recently. As they cleaned up files, one member found a number that looked like it might be a combination. Inside was a parchment behind glass: a “red rose patent,” a land deed granted by William Penn 13 years before the Declaration of Independence. If Templars had drilled the safe, the rapid exposure to light and change in air conditions could have destroyed it. The Hugh De Payens Commandery at 22 S. Third St. sits on the site of Northampton County’s first jail. Penn granted the patent, or deed, free to the county, on one rather obscure condition. The tribute? One red rose, presented in March every year to Penn, his sons or his beneficiaries. It’s sort of the antiquated equivalent of donating a piece of land to a non-profit, but asking for a dollar a year for tax purposes. At one point, each property in Easton had a Penn patent, though most were more like traditional deeds, in that property owners paid a certain amount of money for their property. Now, few of those patents exist anymore, and the red rose patents are even rarer. 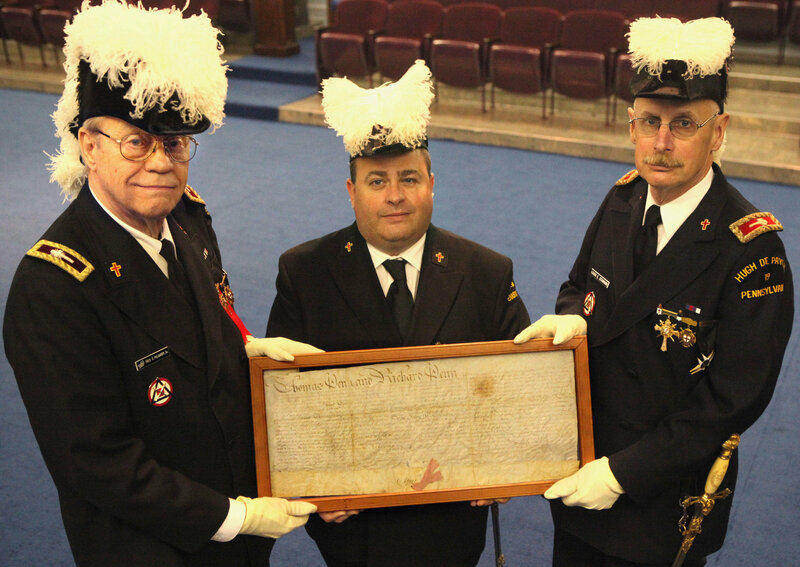 The Knights Templar plan to donate the patent to the Easton Area Public Library on April 26 because the Commandery can’t afford the cost of preserving it for display. “It would take a couple thousand dollars to have it properly taken out of the frame and spread out,” Starniri said. The library, however, may be able to apply for a grant for such services, and would then be able to keep the patent for scholars and schoolchildren to view. The document must be unfolded in the right temperature and humidity so it won’t crack or be ruined, according to Easton Library’s Marx Room coordinator Barbara Wieman. As ink can transfer to glass over time, removing it from its glass frame may also be troublesome. Once it is restored, it will still be handled carefully, Wieman said. If it is hung on a wall, she said, it would probably have a cover over it that could be lifted for viewing. The value of a red rose patent is difficult to establish, but Wieman said the monetary value isn’t what’s important. “It’s not so much the value of the item as its importance to Easton’s history,” Wieman said. The jail’s location was chosen because Easton’s Centre Square originally housed the city’s courthouse. Local officials such as Thomas Craig, who would later become a Colonel under General George Washington, managed the lot on Third Street. After the Civil War, the courthouse was moved to Seventh and Washington streets, and the jail was moved with it. But the patent stayed with the property, although how it ended up in the safe is unknown. Ovide Doublet, the Grand Master’s sec­retary for the French Langues in Malta. 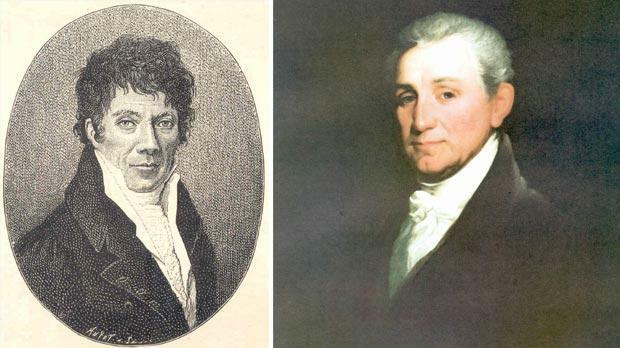 Right: Portrait of James Monroe, US Ambassador to Paris, who negotiated in Paris with the Order of Malta. Someone – it is still not quite clear who – set in motion secret negotiations to draw Malta of the Knights and the United States of George Washington closer together. The commerce of the US would find, in the Mediterranean, ports to secure it from storms and pirates; in exchange for which Malta would possess in America property granted forever. The French Revolution signalled an irresistible decline in the fortunes of the Order of Malta. That (by then) anachronistic Crusader institution could not have appeared more flagrantly ancien régime had it made a deliberate effort to do so: based on the threadbare virtues of privilege and of aristocracy, gorging itself off the labour of others, shielded by a system of law that placed titles and genes above merit and commitment, the Maltese Order struck out as a foul provocation to the values of liberté, égalité and fraternité ostensibly espoused by the new republic. With the triumph of the Revolution, the Knights found themselves targets of the victors’ hate and persecution, and by the end of a series of hostile enactments, the Order forfeited virtually all its property and revenues in France, which till then represented the largest spread of its capital assets and source of income. By the time the Jacobins had consolidated their supremacy, the Hospitallers teetered on the verge of bankruptcy. Something had to be done to redress that huge and sudden shortfall – and it was hardly enough for the distraught Grand Master to offer to live, as he did, on a few francs a day. The best brains of the Order set to work to explore alternative sources of prosperity. The financial catastrophe urgently required fresh rethinking, and some of it went in the direction of tapping into the sympathies and resources of a brand new independent state that to the enlightened already showed the promise of becoming the wealthiest world power – the infant United States of America. The Order of St John, or more accurately, individual knights of Malta and a good number of well-trained Maltese seamen, had contributed remarkably to the struggles of the American colonies to emancipate themselves from Britain and to gain their nationhood. Benjamin Franklin, the first US ambassador to Paris, had acknowledged the Maltese input towards the success of the War of American Independence. On April 6, 1783, he sent Grand Master de Rohan a specially minted medal coined on his initiative to honour those who had significantly promoted the ultimate victory. This medal, which Rohan cherished and proudly displayed in the Palace ‘cabinet’, could very well have been the one designed jointly by Franklin and Voltaire in 1778. Together with all the other precious objects collected by successive Grand Masters and displayed in the ‘cabinet’, Benjamin Franklin’s medal has sadly disappeared. In Franklin’s words, that medal represented “an homage of gratitude”, and to the rhetoric he added a broad hint about the desirability of ensuring the protection of US citizens in Maltese ports. The former 13 colonies had finally seen their independence from the British crown internationally recognised in 1783, shortly before the Order of St John suffered its debilitating losses in France. Someone – it is still not quite clear who – set in motion secret negotiations to draw Malta of the Knights and the United States of George Washington closer together, and to work out schemes of co-operation that would be of mutual benefit. Curiously the blueprint was sketched by French Hospitallers in France itself, though the launch of such a high-risk gamble would surely have been submitted for the prior approval of the Grand Master, Emanuel de Rohan. The private papers of a future President of the United States, James Monroe, tell us a lot about this bold, creative idea meant to link closer together the destinies of the new colossus and of the ancient dwarfling. Monroe’s letters and other writings, published in 1899, include the correspondence exchanged in 1794 between the Order of Malta and the American ambassador in Paris, the future President. I am not aware that a copy of these writings exists in the Maltese archives. Historians, including Edgar Erskine Hume in the US and Dr Paul Cassar in Malta, were acquainted with this episode and made good use of it. I propose to trace some unknown contours around their research. Firstly, who were the two ‘conspirators’? On the Maltese side, a Monsieur Cibon; across the divide, the fifth American ambassador to Paris, James Monroe. I have found it anything but easy to flesh out Cibon. He represented himself as chargé d’affaires at the Order’s legation in Paris. After the confiscation of the Order’s huge holdings in France in 1790, a trickle of diehard aristocrats still sought to join the Order of Malta, among them featured a certain Jean-François Eleozar Paul de Cibon, who was inducted in the Order on October 13, 1792. But our chargé d’affaires is never referred to as Fra or Frere as all professed knights were, even in revolutionary times, and anyway, the knight Cibon would have been far too young, just three years after his profession, to be placed on the hot seat – acting ambassador to Paris during the most turbulent times in French history and the most dejecting times in that of the Hospitallers. That, I believe, rules the knight de Cibon out. Doublet adds some more details about Cibon whose father had also been employed as secretary of the Maltese embassy in Paris. When the father died, Cibon Junior eased himself into his father’s job. He did that in extremely dangerous times, with the French General Assembly deliberating the abolition of the Order of Malta, the confiscation of all its properties and the repressive forces of the Revolution arresting the Order’s more vocal members. Cibon believed there could still be room for compromise and manoeuvre, if only the Order negotiated with France its prime negotiable asset: the use of its harbours and hospitals. Probably rightly but certainly sadly, Grand Master de Rohan felt it infra dig even to think of discussing anything at all with a riff-raff revolutionary administration not as yet recognised by any civilised nation. And the fact that Cibon did not belong to some knightly rank, however lowly, caused Rohan to disregard his counsel and to distrust him – he did not even feel he had to mention Cibon’s proposals to the Council of State or deign to reply to his dispatches proposing negotiating with that ‘enemy’ scum. And yet, as a mere secretary to a hostile embassy, Cibon had succeeded in obtaining the release of some knights of Malta detained by the revolutionaries. Only one source I know of gives more details of this brave man’s name: d’Elzear de Cibon – not the same person (the secretary was married with children), but probably closely related by family ties to the freshly-knighted Eleozar de Cibon. And brave he undoubtedly was, to persevere in his determination to remain living and holding the fort in a wholly malevolent and inflamed Paris, representing an impeccably aristocratic Order whose members were singled out for hate, vendetta and, when the happy occasion arose, for assassination. We know something more as to how the hot potato of taking care of Hospitaller interests in France landed in Cibon’s hands rather than someone else’s. Grand Master de Rohan, fully conscious of the rabid anti-ancien régime fury prevalent in Paris, thought it prudent not to name a new ambassador to France to replace the Balì de Brillane after the latter passed away. De Brillane had abruptly dropped dead, suffering a fulminating stroke on his way out of a meeting with the royalist minister Armand-Marc Montmorin, later duly massacred by the revolutionary mobs. The Grand Master delegated the interests of the Order of St John in Paris to Commander d’Estourmel, under the guidance of the Balì de Virieu, until such time as the mass turbulence and hysteria would have somehow quietened down. The Balì de Hannonville arrived in Paris in 1795 as Ambassador Extraordinary of the Grand Master, but when he requested to present his credentials, the Minister of Foreign Affairs, Charles-François Dela­croix, rebuffed him with the news that he was persona non grata and that his presence in Paris was “disagreeable to the Directorate”. (Delacroix featured, officially, as the father of the renowned ‘romantic’ painter Eugène, but… gossips just laughed loud and, in those pre-DNA days, boy, did they snigger and scoff). In retaliation to the Paris affront, the Grand Master refused to receive a French minister on a visit to Malta. Compelled by adverse circumstances, Rohan allowed M. Cibon Junior to remain in Paris, but only as a low-profile secretary to the legation. From being a lively and populous embassy, the Maltese one was now reduced to a one-man outfit. Cibon had to cope with the stresses of the Revolution in Paris virtually on his own. Cibon knew full well that one of the weakest links in the chain of the emergent American power was its inability to protect and defend its commercial shipping in the Mediterranean, especially from the almost daily depredations of the Barbary corsairs and pirates. Just before the Hospitaller secretary’s letter to Monroe, the US had acknowledged the threat to their interests in the Mediterranean and had consequently reached a momentous decision: concrete measures had to be immediately undertaken to lay down an armed fleet in order to protect their Mediterranean lines of communication. The US navy was born in March 1794 with the Mediterranean situation expressly in mind. However, though the determination was there, the American warships were then few, they could rely on no supply and maintenance home ports in the Mediterranean, and they depended for logistical support on bases thousands of nautical miles away. The US had, with a gun to their head, concluded treaties with the Barbary rulers in terms of which they paid the turbaned extortionists huge sums in the form of protection monies in exchange for shaky guarantees that US shipping would not be attacked. In Cibon’s time, this protection racket was costing the taxpayer 20 per cent of the annual USfederal budget. Surely a secure, well-furnished and friendly base in Malta would be an attractive, cost-saving investment for the US against that odious and institutionalised Barbary blackmail? Was not this the proper time for the Order’s invoice of courage, blood and goodwill raised against America during the war for independence, to be presented for payment? Picking up the ideas already toyed with by Franklin and Rohan in 1783, Cibon, in a letter written 11 years later, pleaded with the US Ambassador James Monroe to weigh in his mind the reflections he annexed and then to give him his frank reaction to them. He began by a high-sounding rhetorical flourish: some nations naturally become rivals and oppose each other because of their position, their industry and their courage. Others, for the same reasons of courage and industry, discover their attraction to each other – they “feel a motive to esteem, approach and unite together, to increase their mutual prosperity and to render themselves reciprocally happy by a continual exchange of attentions, regards and services”. With this introduction in place, the next fanfare follows naturally, and very quotable it is too: “The United States of America and the Island of Malta, notwithstanding the distance that separates them, do not appear to be less bound to cultivate a close and friendly union between them by motives of interest and by those of benevolent amity”. Cibon then reminded Monroe how attractive the Mediterranean had become to industrious American merchants and mariners, always present in that sea in large numbers “forgetting the dangers to which they are exposed of becoming a prey to the Algerine corsairs who cover that sea”. And here Cibon starts advertising what Malta has to offer to the USA. Cibon played with the Americans the same card his gambler instinct would have chanced with the French revolutionaries had Rohan encouraged him to: the offer of the use of Malta’s fine harbours and of other maritime facilities in a bid to regain some of the confiscated Hospitaller properties. Cibon reinforces and clarifies his proposal: “Thus the commerce of the United States would find, in the Mediterranean, ports to secure it from storms and vessels given to protect it against the pirates of Algiers; in exchange for which Malta would possess in America property granted forever, protected by the United States and guaranteed by them in the manner most solid”. Fine negotiator. Cibon’s proposals ad­dressed the main concerns of either party. US navigation suffered manifestly from a lack of maritime bases and facilities in the Mediterranean, on the one hand, and, on the other, the Order had never stopped hankering after its own centuries-old colonial fantasies – vast lands to be taken over, exotic or otherwise, outside its domestic confines. Some had been pipe dreams, like the purchase of Corsica, repeatedly entertained by more than one Grand Master, or the colonisation of Abyssinia, or the acquisition of large tracts of Canada like Acadia. Others, like the annexation of the islands of St Kitts in the Eastern Caribbean, had, if only briefly, come to pass. Monroe, a seasoned and far-sighted politician, knew at once that the Maltese offer was, at least in theory, highly attractive and he did not dismiss Cibon’s “reflections” outright. He was a founding father of the United States and eventually became their President (1817-1825). When still Colonel Munroe, he had been sent as minister plenipotentiary to represent the United States in France in 1794. He was, by political theory and personal conviction, a strong supporter of the French Revolution, though during his ambassadorship he distinguished himself by opposing, and courageously too, some of its excesses – he succeeded in freeing all Americans imprisoned by the revolutionaries, including Thomas Payne and the Lafayette family. He must have found himself somewhat torn apart by his personal empathy with the Revolution, and the request of Malta, a small anti-revolutionary state more aligned in political conservatism and regression with his old monarchical British enemies than with his new French friends. OKLAHOMA CITY (Reuters) – The nation’s second-largest Indian tribe formally booted from membership thousands of descendants of black slaves who were brought to Oklahoma more than 170 years ago by Native American owners. “And our ancestors carried the baggage,” said Marilyn Vann, the Freedman leader who is a plaintiff in the legal battle. Officially, there are about 2,800 Freedmen, but another 3,500 have tribal membership applications pending, and there could be as many as 25,000 eligible to enter the tribe, according to Vann. The tribal court decision was announced one day before absentee ballots were to be mailed in the election of the Cherokee Principal Chief. “This is racism and apartheid in the 21st Century,” said Vann, an engineer who lives in Oklahoma City. Spokesmen for the tribe did not respond when asked to comment. The move to exclude the Freedmen has rankled some African American members of Congress, which has jurisdiction over all Native American tribes in the country. A lawsuit challenging the Freedman’s removal from the tribe has been pending in federal court in Washington, for about six years. As a sovereign nation, Cherokee Nation officials maintain that the tribe has the right to amend its constitutional membership requirements. Removal from the membership rolls means the Freedmen will no longer be eligible for free health care and other benefits such as education concessions. 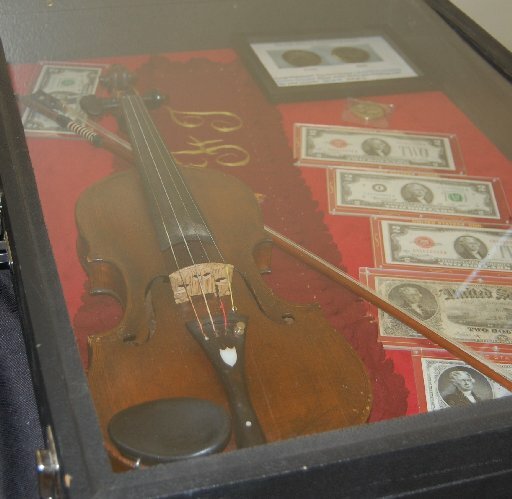 STERLING — A walking stick used by Abraham Lincoln and a Thomas Jefferson’s violin. Those are just a couple of the items that are part of a display from the Sterling Masonic Lodge that is now setup at Sterling Public Library. According to Chaplain Bob Elsloo, the display is traveling museum of just a small portion of the items that are at the M.W. Grand Lodge of Colorado A.F. & A.M., in Colorado Springs. The Grand Lodge Library and Museum is open from 8 a.m. to 4 p.m., Monday through Friday. “It’s just one way to get out in the community and commemorate 150 years in Colorado,” Elsloo said about the display. Colorado became an official territory, the Grand Lodge was formed on Aug. 2, 1861. Elsloo said the traveling museum is just one of many things the Masons are doing this year to celebrate 150 years in Colorado. The display includes a video about the pieces on display and the history of the Masons. There are also poster boards with information about the beginning of Masonry in Colorado and 150 years of Masonry in Colorado. There is also information about Masonic United States presidents. Between 14 and 16 presidents were Freemasons, beginning with George Washington and ending with Gerald Ford. election because he was a Mason. He planned on reapplying for membership after his presidency. Jefferson was believed to be active Mason during his life; however, little record of his Masonic activities exists. Other items on display include a Civil War bone pipe carved by a prisoner of war during the Civil War, a letter from George Washington to the Grand Lodge of Pennsylvania, a picture of Theodore Roosevelt in Masonic dress and a variety of Past Grand Master and Past Master jewels and Grand Lodge officer pins, among other things. There is also information about the first cornerstone in Colorado, which was laid by the Grand Lodge of Colorado Territory, for the depot of the Denver Pacific Railway Company. The Sterling Masonic Lodge is planning a cornerstone ceremony for the library, to be held at 10 a.m. Wednesday, July 20. “It’s kind of a really neat historical ceremony,” Elsloo said. He said the Grand Lodge officers will be there and the ceremony will be similar to the cornerstone ceremony held at the capitol of the United States, in Washington D.C. There will be a luncheon at the Sterling Masonic Lodge following the ceremony. “Everyone is welcome,” Elsloo said. Freemasonry is a fraternal association based on philanthropy. There are many groups in Masonry, which include the Shriners, Knights Templar and Scottish Rite. There are currently 2.5 million Masons in the U.S. and 4 million worldwide. There are about 11,000 members of the Masonic Fraternity in Colorado. In North America the Masonic Fraternity gives $1.5 million a day to a number of charitable causes, ranging from operating children’s hospitals, funding medical research, treating childhood language disorders and providing community services. The Sterling Masonic Lodge does a number of things for the community including offering a child identification program, providing scholarships to high school students for college and sponsoring high school students to go to a band camp in Greeley where they march in the Greeley Stampede. Elsloo said the students the Colorado Masons sponsored this year, who just marched in the Greeley Stampede’s Fourth of July parade last week, took first place in state, over Maple Grove Marching Crimson and 101st Military Band. The group included three students from Sterling. “To place first in those standings is neat,” Elsloo said. Some of the students have never marched in a marching band before but they spend three days learning how at the camp, which is facilitated by the University of Northern Colorado music department. Teachers at the camp include instrumentalists from all over the U.S. The Masonic display will remain at the library through the end of July.